The Wombats – These brits were very pop synth heavy. I completely dug them and their opening energy. The only problem was they kept messing up the start of their songs. That’s okay, they filled time well and were even a little tongue and cheek about it. Los Campesinos! – These guys seemed a bit on the preachy side. I was in to about half their stuff really. The British boy singing was very rebellious sounding but it also leaned toward the whiny side. I thought the keyboard lady was kinda cute and she held her own as a backup singer. Meanwhile in the crowd we had a Yoda on a stick. Only at Austin City Limits. Delta Spirit – Theses guys have been on my SXSW list for the last couple of years but I kept missing them. I redeemed myself this time, however. I was expecting a major blues explosion but what I got was more of a modern rock jam that tended toward the blues. I think if you are in to non-threatening rock and roll, these guys will fit the bill. A-Trak – I caught a clip of him before at SXSW two years ago but did not get to audibly munch on an entire set. Welp, I snacked on most of a set this time and it was the part of the whole day where the entire crowd was bouncing. A-Trak knows how to work a crowd and he most certainly marked the mid way point of the day with closing act energy. The Afghan Whigs – You know sometimes at music festivals you need to take some time to walk down memory lane and/or fill the historically important bands on the bill. The Afghan Whigs fit that nicely. They dug up their 90s alt-rock roots and exposed it for the crowd of hopefully new fans. I knew them from way back in the day (I’m old) and I enjoyed every minute of it. Hopefully a couple of young whipper snappers did too. Florence And The Machine – Here’s where the heavy hitters came through. Florence and the Machine broke through last year and they were on my list of must see bands. Granted I was far away, but I got a great sampling of their jams. The only complaint that I had was that Florence was too yappy on the mic. I get that you want to share an awesome time with people, but sing your songs instead of having conversations with them. Thievery Corporation – Now was time to fill the underground monster gods part of the day. Anyone who’s anyone in downtempo land knows the name Thievery Corporation. What most people don’t know is that they are pioneers of the genre. Even more so, they transformed their live act to include more instruments instead of samples heard on their albums. Great, great, set and I recommend jamming out to these guys if they every show up to your neck of the woods. The Black Keys – Finally I ended the night with the blues gods that are The Black Keys. They touched upon all of their history and rocked out immensely. Unfortunately, like last last year, I was too far away to get a great shot of them, but I still got to rock out to their tunes. It’s blues power and you all need to plug in to their ample energy. 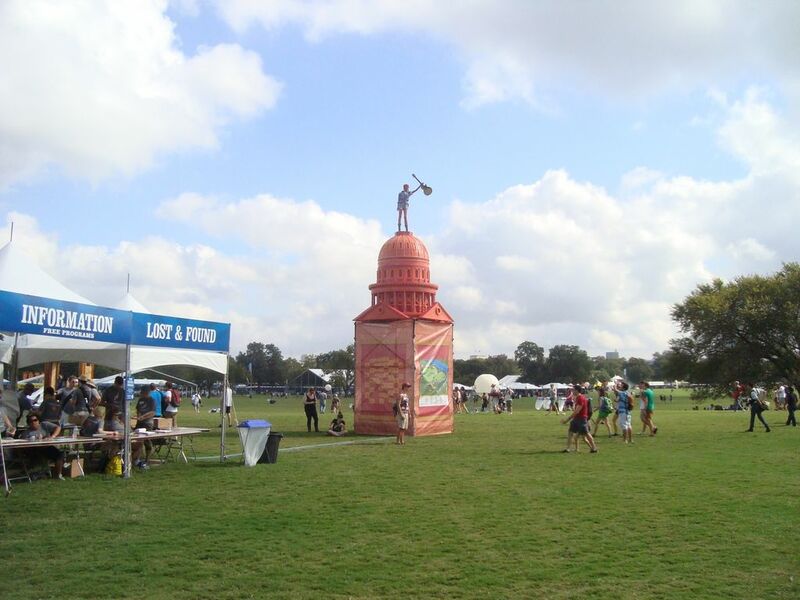 All in all, the 2012 edition of my Austin City Limits adventure was a success. Even more so, I didn’t cut out early like last year. So now that I’ve conquered the 2012 edition of a single day of Austin City Limits, it’s my pleasure to announce that I will be doing all three days next year. Thank you souvenir sale. I’m sure the rocking will be three times as hard and I will let y’all know about it when it hits.